The first thing you see when you open my front door are the steep victorian stairs. 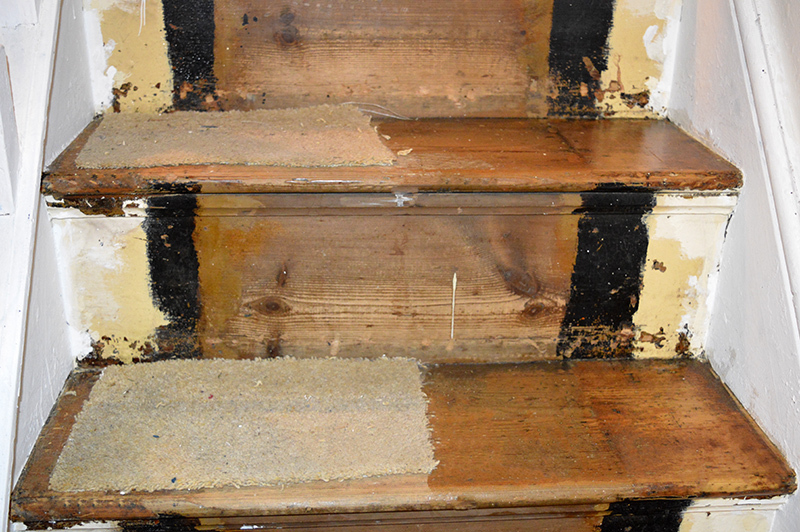 These stairs have been crying out for a transformation. I finally I got rid of the boring beige carpet that was just a dust and dirt magnet and brightened them up with a touch of Marimekko. Everytime I open the front now, I can’t help but smile at my lovely cheery stairs. Even my teenage sons who don’t normally notice anything round the house, have told me without prompting how much they love the new stairs. 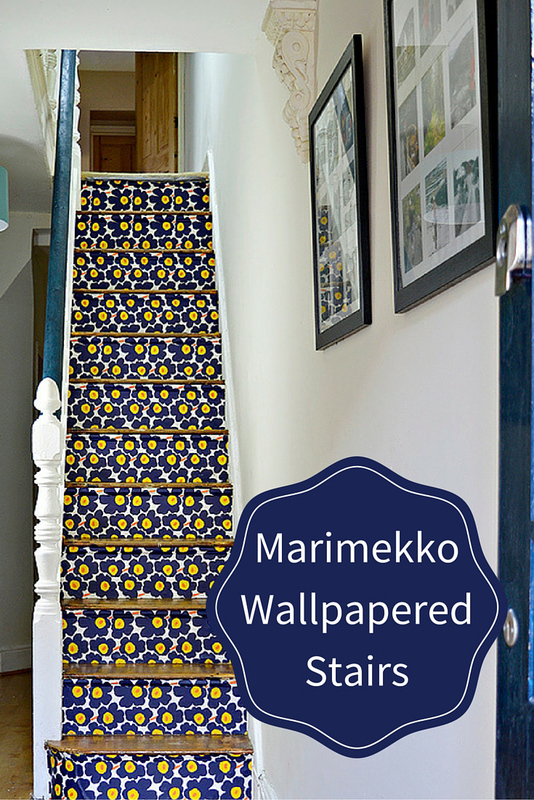 My Marimekko stairs were achieved by wallpapering the risers in Marimekko wallpaper. Other wallpapers are available but I do have a bit of a thing about Marimekko. In the past I have Marimekko’d shoes, a bench, and even a giant papermache cactus. The first thing I did was to remove the old carpet. As these were the only stairs in the house and I live in a busy household with people constantly going up and down the stairs, I decided to remove the the carpet one stair at a time. I don’t know if you have lifted the carpet off your stairs before, but what is underneath are lethal carpet grippers and nails. Stepping on one of those grippers is going to hurt. Using a Stanley knife I cut the carpet off each stair one by one, removing the grippers and nails before moving on to the next step. 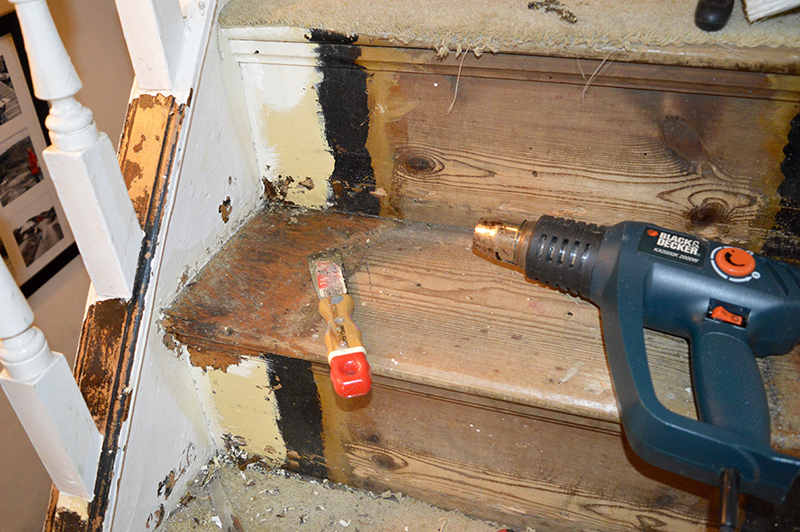 Once all the carpet was finally removed I then used the heat gun to strip any residual paint on the stairs. The stairs in my house are over a hundred years old and had been obviously been painted before. As I was going to be wallpapering the risers, I only needed to remove the paint on the top of each step. The stairs were then sanded with an electrical hand sander before varnishing. Varnishing the stairs proved tricky as I didn’t have the option of making them out of bounds for a few hours. 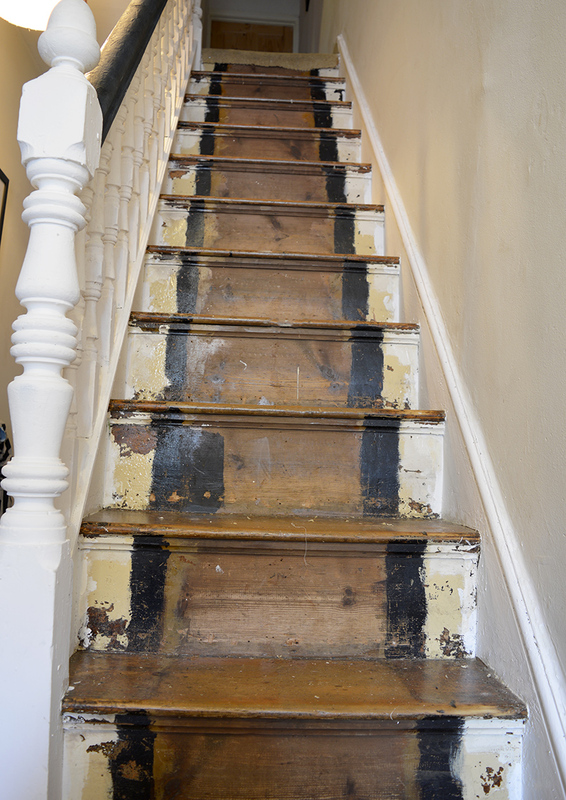 Also being old victorian stairs they were too steep to varnish every other step and then just use every other step until dry. I ended up varnishing the stairs in 2 halves, so everyone could walk down one side of the stairs while the varnish dried on the other side. I applied 2 coats of varnish on the stairs one in the morning and another last thing at night, so this took a couple of days one for each side. The banister and railings were also given a new coat of paint. The banister was painted a dark blue to match my chosen wallpaper. I had noticed that my white banister had got very grubby over the years and I was hoping that a blue banister would fair better. 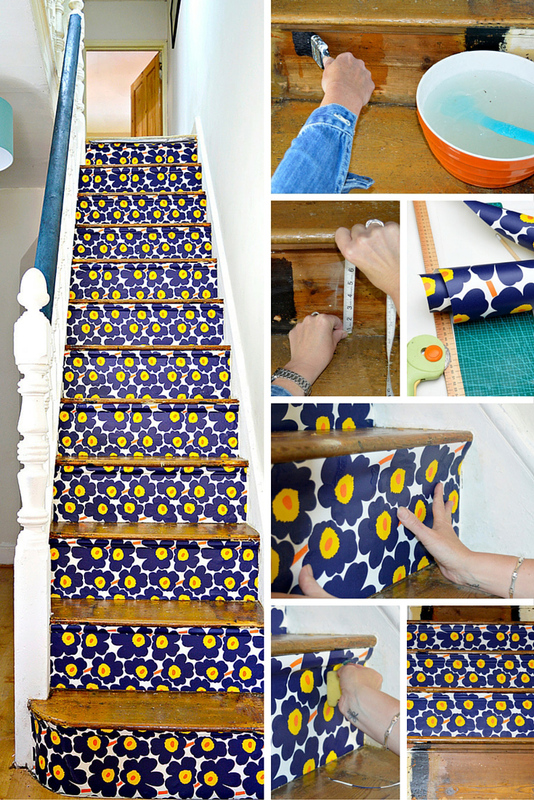 What you need to wallpaper stairs. Half a roll of wallpaper- I chose Marimekko Pieni Unikko wallpaper in blue. 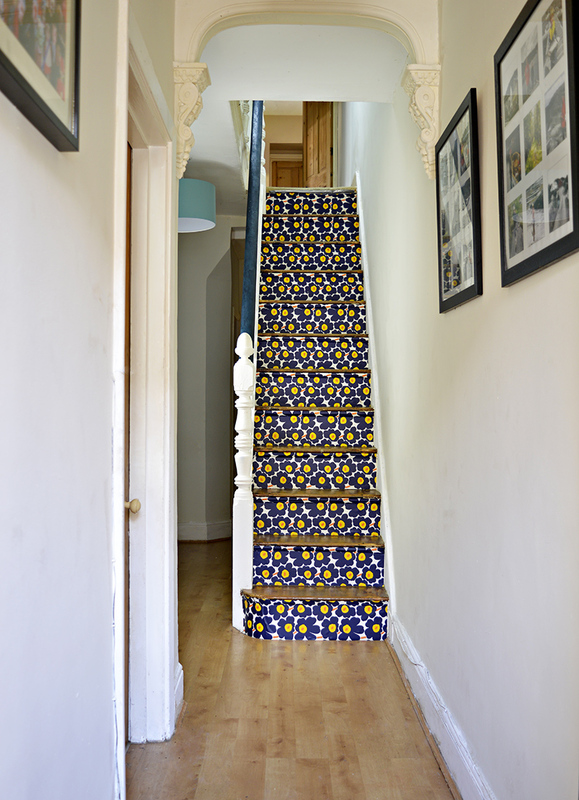 I could have wallpapered the stairs on my own but decided to rope in the help of my friend Wendy, who is an expert at upcycling with wallpaper. To make sure that the wallpaper will stick to your stairs well, key them first. I did this by applying a coat of wallpaper paste to each stair riser and letting it dry thoroughly. Measure the width and length of each step riser. It may be awkward to get an accurate measurement, it’s always better to measure too big, then too short as you can trim later. Using a rotary cutter and a cutting mat cut your wallpaper for each step. You will have to think how best your chosen wallpaper pattern will work. I was lucky as the Marimekko pattern I chose worked either way up so I was able to cut my wallpaper to the length of my stairs and thus avoided any joins. Paste up your paper well with wallpaper paste and then place carefully on each step, positioning from the bottom up. When in place, go over the top with a damp sponge pushing the wallpaper into any grooves. Continue until all the stairs are finished leave to dry thoroughly. Even though the wallpaper is washable to protect it further apply a coat of varnish to each step. I love it now when I open my front door and see my lovely Marimekko stairs. 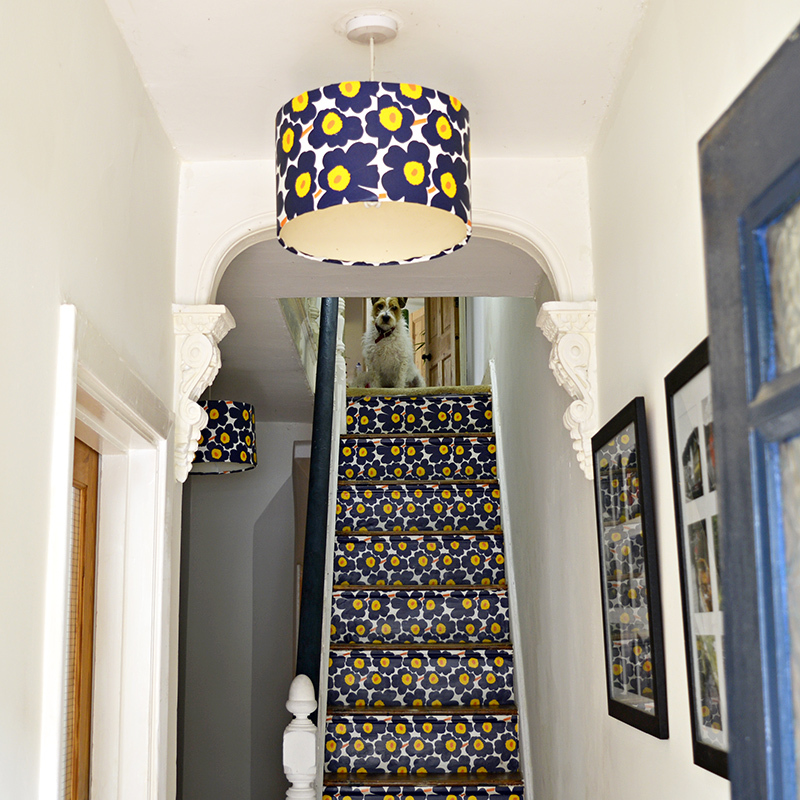 Since publishing this post I have now covered the lampshades in my hall way to match my Marimekko stairs, you can check out how to wallpaper lampshades here. 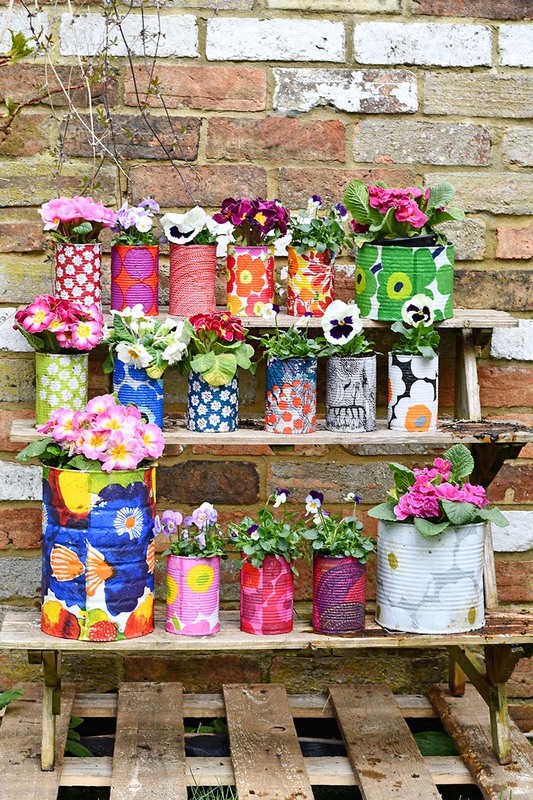 If the Marimekko stairs are a bit bold for you or if you love Marimekko, how about moving the Marimekko into the garden with these gorgeous upcycled Marimekko decorative tin can planters. For even more fantastic wallpaper ideas check out my awesome creative wallpaper ideas and brillaint ideas for upcycling with wallpaper. Thank you, Naomie, yes they are steep! A very clever way to use wallpaper. None-the-less, the blue on the stair railing and the navy blue in the wallpaper are discordant, one is greenish blue and the other is black blue. It would have been better if you repeated the navy on stair railing or painted it a color with less contrast. Thank you! Thanks for your suggestion. Not my choice of colors but it’s a great improvement. I can’t understand why someone (and I suspect it was a previous owner) covered those beautiful oak treads with carpet to begin with. That’s a stunning feature and certainly not cheap. I suppose if it was me I’d mimic another similar re-do I saw. I’d use wallpaper that looked like birch trees on the risers or even bricks or stones. But, it’s clear your choice of color is blue and it looks great. Thank you! I agree that it is a great improvement and I know my choice of wallpaper is a bit too bold for some people’s taste. I do like your idea of birch tree or stone wallpaper I think they would look great too. Oh good lord, these look amazing! What a fab thing to walk in to every day. Thank you, they still make me smile 8 months on ! Wow! How super fun this looks! I love it! So bright and cheery! Thank you ! They are still making me smile everytime I open the front door. This is an absolutely spectacular project. I love how it turned out. I really need to speak up, though, about using the heat gun on the paint in your old Victorian home. Statistically your home is covered with lead based paint and using a heat gun on lead-based paint releases a dangerous amount of lead for you and your family. I work for the Cincinnati health department childhood lead poisoning prevention program and I would be happy to give you more information. Or you can just Google it and you’ll find information from the EPA and from HUD. Best of luck! I look forward to seeing more of your projects. Perhaps your local health department has the ability to check paint for you before you continue on a project. Thank you and thank you for your concern, I will check the paint next time. Okay Claire… This project completely blows me away! I’m also a Marimekko fan, and recently I’ve been in my Orla Kiely phase! Thanks, love Orla Kiely too. In fact my crafty pal also called Wendy is a huge Orla Kiely fan too! Next week I’ll be showing some Orla Kiely lampshades she made. WOW, I love it, it’s so vibrant and colourful, it really gives a totally different feel to your hallway and stairs, amazing! Thank you ! I was a bit apprehensive myself at first but glad I didn’t play it safe in the end. I love the fact that it’s bold. Wow! That is such a gorgeous transformation! I love the bold color and pattern, and you blended the stain beautifully considering you had to do each side separately. I followed a link from link up party and checked what other things you do and then I saw Marimekko print on these photos, print that I know quite well as I’m from the country of Marimekko’s. I have seen it in many different colours and almost everywhere but seeing it in a blog that isn’t Finnish was a surprise. 😀 Great job with the stairs! Thank you ! I love Marimekko prints and have used them for other projects on my blog, like a bench and a giant paper mache cactus. My husbands family is from Norway so share a border with FInland. I have been to the Merimekko shop in Oslo (very small), but would like to visit the one in Helsinki one day. So Gorgeous!! I love that you used wallpaper, and what beautiful wallpaper. I have never redone stairs, and that looks like some work doing the prep, but your finished project looks like it was worth every second. That would make me smile too seeing it everyday. Great work and great tutorial. Thank you ! It was definately worth the work. Claire this is brilliant. The pop of color that is right there as you walk into the house can brighten anyone’s spirits. An ingenious use of wallpaper. You would not know it was the same house. Thank you so much. It’s great now to be greeted by something bright and cheery when I open the front door. Your stairs turned out amazing Claire! Love how fun and funky they are. Thanks so much for sharing at Vintage Charm. .Thank you very much ! This looks like a completely different staircase! I love the way it turned out! It looks like a lot of work to me though. I’d find it a bit daunting to take this on. But, bravo to you! Thank you it was well worth the work. The transformation is fabulous! It looks like decorative tile. It looks like a lot of work, but you pulled it off. Thanks for sharing this delightful project at DI&DI. What a fun makeover…well, the result is fun, it doesn’t look like the process was fun at all! Your hard work was all worth it, though, as the outcome is fun and certainly an improvement over the carpet! What a bright and fun welcome you get when you open your front door now! Thanks so much for sharing over at the Celebrate Your Story! link party! Hopefully this will inspire some more folks to take on their staircases. I live in a one story now, so no more stairs for me! Thank you very much. It’s still making me smile everytime I open the front door. Wow, it looks amazing! !Great transformation. Thank you for sharing with us at #HomeMattersParty .We would love to have you again next week. I couldn’t have been more excited about seeing your Stair Project! My stairs are sort of tucked away but I’ve been wanting to do a redo on them for some time. Yours look amazing and add such character and a personality to your stairs. I’m totally inspired. Thank you for sharing over at the Happiness is Homemade Link Party! Thank you so much, happy to have inspired. Good luck with your stairs. Your stairs are delightfully charming! Thank you so very much for joining us at Thoughts of Home on Thursday. Have a wonderful holiday weekend. Thank you! Hope you have a good weekend too. Wow wow wow! Really fabulous. Glad you added some varnish as stair risers do get wear and tear and hopefully this will last a while! thanks for sharing on craft schooling Sunday! Thank you ! I’m sure they will last with the varnish. I know other people who have wallpapered their stairs and it#s lasted years. I don’t have stairs but I love to see the creative ways people redo them over from the carpet. Your transformation is so attractive. It adds such cheerfulness to the stairway. Thanks Mum, thats another project for another day ! Oh my goodness- this is amazing. Not only is it clever and creative and colorful, but you executed the process so well. I am afraid I would have created a big hot mess! Thank you for being at TOHOT! ADORABLE! That pattern is so lovely! Thanks for the detailed tutorial. I love your stairs! Its beautifully done. I really like that you painted the railing a dark blue as well, I think it really pulls the look together! Thanks ! I’m going to wallpaper the lampshades next to match and paint the picture frames the same colour as the banister. Very charming. Kids would love your home too! Thank you ! Mine do. Claire, this is pretty darn brilliant! 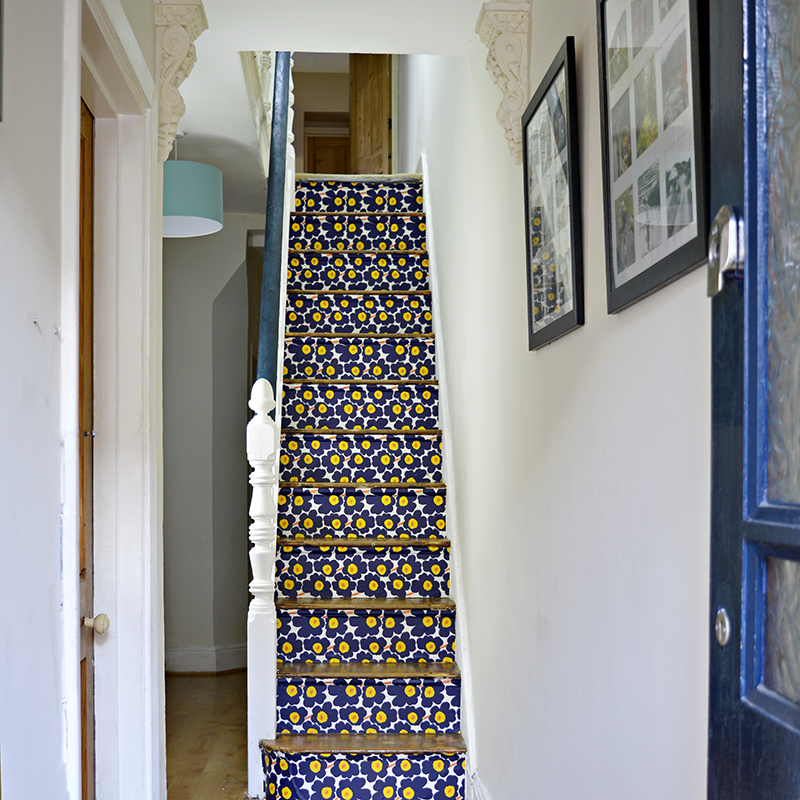 The pattern you chose is fun and definitely beckons people to go upstairs. Now you come remove the carpet from mine? Thanks ! I think carpet free stairs are the way to go so much cleaner and fresher. Wow those stairs looks steep! Great job – I love what you’ve done! It’s a nice pop of colour in the space. Thanks ! I do like a pop of colour. Your stairs turned out wonderful! Love the pattern you chose-pinned too. Thanks so much for joining us at TOHOT. Thank you ! The pattern is actually over fifty years old it’s a classic Marimekko. Jackie Kennedy once had a dress in the UNIKKO print. Nice bold statement of art! Thanks ! Yeah I decided not to play it safe, and I’m really pleased I didn’t, I love it. Thank you and thanks for your help ! I don’t have stairs in my home but if I did, I’d do exactly what you have done. They are so fun and such a great pop of color against the white walls. And if you get bored, you can just rip it off and start over! Visiting from Redo It Yourself Inspiration party. Thank You ! That’s what I thought if I don’t love it I can just strip the wallpaper and choose a different one. Lucky for me not only do I love it but my husband and boys do so it will be staying for awhile.